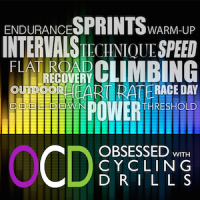 I teach many endurance classes at my local YMCA and since the majority of these rides include a lot of seated flats and climbs at aerobic threshold, I am always looking for fun ways to spice it up either with music choices or with drill work. One of my favorite drills is from a profile aptly called Move Your Feet. The profile is composed of accelerations and rolling hills, but we finish it off with a tribute to Napoleon Dynamite. If you’re unfamiliar with the movie, it’s important to note that there’s a dialogue between Napoleon and Pedro where Napoleon discusses the importance of having good skills. While we’re not practicing our nunchuck skills in the studio, we are going to practice our pedal stroke skills, which will make you a more efficient cyclist and maybe, if you’re lucky, you too can impress the ladies (or guys)! This is a one-legged drill, but at no time do you remove a foot from the pedal. They are also known as single-leg isolation or dominance drills. One leg focuses on turning the pedals while the other one relaxes. You will alternate between the two legs. For a more detailed explanation of single-leg dominance drills, please see the Face of the Clock drill.